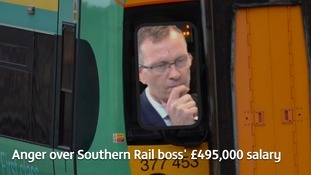 The chief of crisis-hit Southern Rail network has been paid £495,000 during a year in which the service was crippled by strikes. It's a hugely disappointing outcome for our passengers, particularly as the agreement carried the full support and recommendation of the ASLEF leadership. We have shown a willingness and desire to find a solution to their dispute and we will now, once again, sit down with the union, understand the issues which led to this regrettable decision by the drivers and try and find a way forward to resolving it." Train drivers at Southern have again rejected a deal for a Driver Only Operation. The RMT has released a statement following ASLEF members' decision. This ballot was entirely a matter for ASLEF and its members. However, the result reflects the continuing and deep seated concern amongst drivers and the wider workforce over the extension of DOO and the safety impact on passenger services. Southern Rail cannot jam their heads in the sand any longer. We are in talks with the company tomorrow and we now expect the fundamental issues at the heart of our guards' and drivers' disputes to be taken seriously. There's an easy solution to this long running industrial dispute and Southern Rail need to join with the unions in reaching an agreement that protects passengers and which recognises the safety critical issues our members have been fighting for over the past year." Train drivers at Southern have again rejected a deal for a Driver Only Operation. It means more strikes can't be ruled out. It is the second time the deal has been put to members in the year long dispute - and thrown out. Under the proposed agreement drivers would continue to close train doors and in some "extreme" situations would drive trains without a second member of staff on board. This has long been the sticking point. The unions had insisted on a safety trained second member of staff on every train. After weeks of talks ASLF, the drivers' union, hammered out a deal that would mean only in exceptional circumstances would a driver work a train alone. There were promises to improve in-cab cameras used to monitor doors. However this has again been rejected. The other union involved, the RMT, which has staged 31 days of strikes continues to insist on a second member of staff on every train. Bosses are due to meet Southern tomorrow for talks.They have a strike planned for Saturday. However it is Aslef which causes the most disruption with most services cancelled if they strike. By using managers they can run 90% of trains during RMT action. The dispute centres on a move by Southern to change the role of guards to On-Board Supervisors. They no longer close doors but spend more time with passengers. The company says the move is safe and in use on forty per cent of trains. Managers promise no job or pay cuts. They say only is exceptional circumstances would a train run without an OBS but it would be a better alternative to cancelling a train. The RMT says it is not safe and passengers are at risk. It insists there should be a safety critical second member of staff on every train. 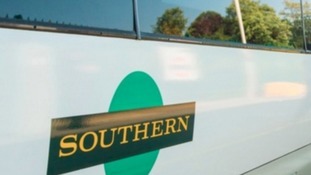 The drivers union ASLEF will meet with Southern tomorrow for secret peace talks, ITV News Meridian can reveal. Business leaders in Sussex are protesting over the continuing dispute on Southern Rail, warning it's threatening the region's economy. Official figures have revealed almost 75% of trains on Southern were late yesterday, the first day the company said it would operate a normal service after months of strikes. Just 26% of trains on the Brighton mainline were on time, rising to fewer than 60% arriving within five minutes which is the industry standard. The figures are worse than the previous day which had a strike by RMT conductors when 40% of trains were on time. The company says it is running a full service now that the drivers union ASLEF has called off strikes this week while peace talks continue and guards are working new contracts which mean they no longer close train doors. The other union involved in the dispute, the RMT, will hold drivers strikes tomorrow and Friday but as they only have twelve members it is not expected to cause any extra disruption. Govia Thameslink Railway (Gatwick Express, Great Northern, Southern and Thameslink) publishes its performance statistics for the previous day by 12pm the following day. 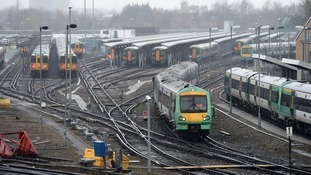 Services on Southern Railway will be at a standstill again today due to another strike by drivers in the long-running dispute over driver-only trains. Members of the ASLEF union are striking for the third time this week, severely affecting the company's 300,000 passengers. Southern is providing 200 buses and coaches to take passengers to nearby stations which link to other rail operators. Southern are advising passengers not to travel unless it is essential. Drivers walked out on Tuesday and Wednesday of this week with further strikes planned for 24th, 25th and 27th January. The RMT union has announced a further 24 hour strike by guards for Monday 23rd January. The walkout is part of the long running dispute with Southern Rail over the role of the conductor. It means commuters now face strikes on 23rd January in addition to the industrial action by the ASLEF union on 24th, 25th and 27th January.